August was a pretty good month for adventures! 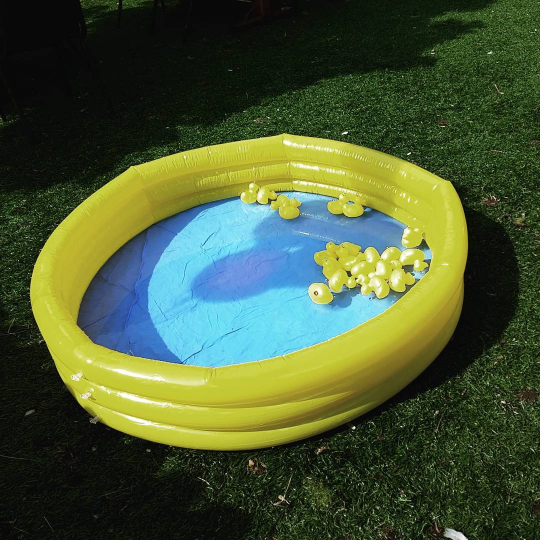 I helped out a friend at a fair in Chorlton which involved manning a hook-a-duck stall. OK so it’s not much of an adventure but it was an alright way to spend a morning before heading to an event at Sadler’s Yard (always a happy time). I went down to Ipswich to visit a friend from uni. Somehow in all the years I’ve known her I’ve never made it to visit her- poor form I know! I’d love to go again and do a bit more exploring. 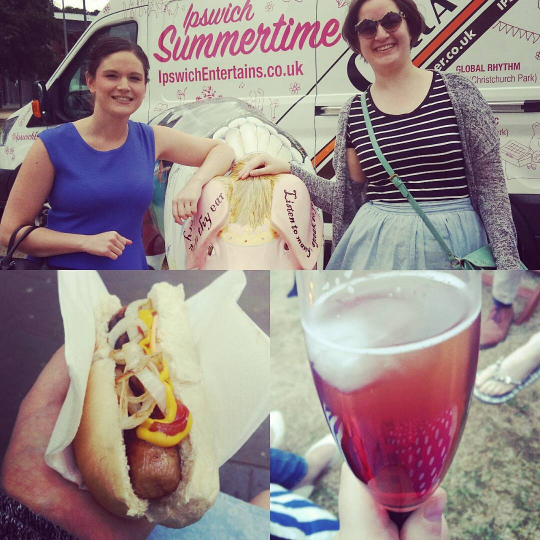 We did the Ipswich Pig Walk, ate hotdogs, and drank lots of prosecco and Chambord. 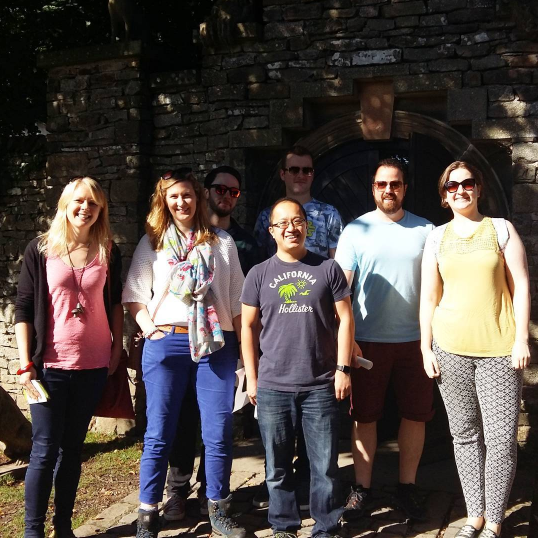 Over the bank holiday weekend I dragged my Manchester crew up to my homeland (in the lovely Yorkshire Dales) where we did SO. MUCH. STUFF. So much stuff. 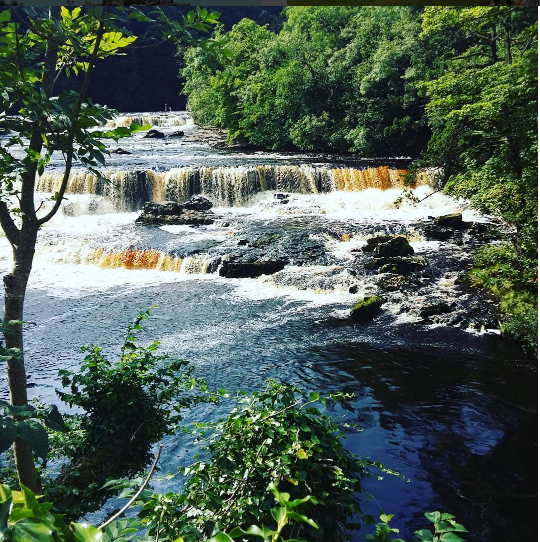 A quick run through: Aysgarth Falls, Wensleydale Creamery, Brimham Rocks, village fair, Brymor, Forbidden Corner. It was genuinely a bit exhausting but so much fun and so nice to show people round my hood! Also my friend had a lovely BBQ one weekend in Didsbury. It rained mostly so we sat inside but the food was cooked outside so therefore it was a BBQ and we won. It was great to catch up with my old work pals (who have since all moved on to other jobs) and talk about things other than work! Hard to imagine I know. Of course I ate many a delicious. Many a delicious thing indeed. 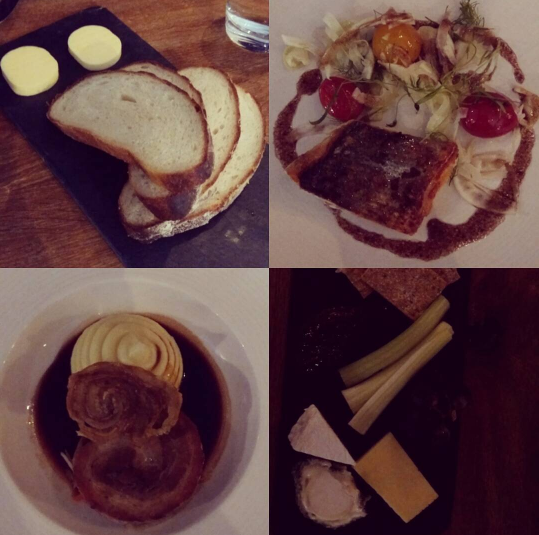 To start the month it was a meal at Damson in Heaton Moor, with the set menu crew. Their set menu is very very good and you should strongly consider going. Pictured below is bread (such good bread- my companion Oonagh compared it to a quilt which was actually completely accurate), seabass starter with tomatoes and fennel, pork belly and mash with an Asian-spiced broth and crackling (an odd but incredible mix of a sort of Sunday roast style meal with Asian flavours), and a cheeseboard. This was also accompanied by some delicious white wine of course. While I had friends visiting we tried to get a table at Alabama’s All American Eatery for brunch and were told we’d have to wait an hour. That of course was not going to work- no offence Alabama’s, I’m sure I’ll be back! So we wandered briefly up the road and happened upon Ezra & Gil, where I’d been before for cake and coffee a few times. This was a very different brunch than we had set our hearts on- lots of avocado and freshness rather than bacon and stodginess, but it was glorious nonetheless. I had soft boiled duck eggs with sourdough soldiers and because I’m a greedy genius, I ordered halloumi on the side for dipping. Oh yum. 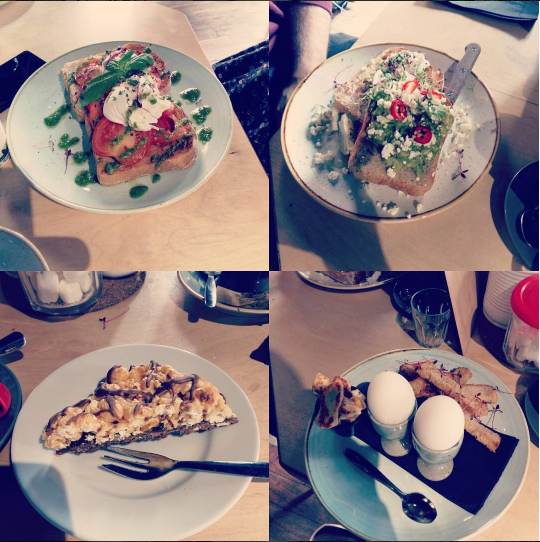 My friends had various sourdough, avocado, poached egg type dishes- I’ve forgotten exactly what they were. Oh and I also had a toffee popcorn slice. It was nice, not great though, but nice to have something a bit diferent. While up in the Dales we ate at Rustique in Richmond, which I would 100% recommend if you’re in the area. It’s one of my all-time favourites. I didn’t take any pictures but I ate breaded brie, confit duck with dauphinoise potatoes, and drank a lovely Beaujolais. The set menu (so much love for a set menu) is excellent value. I could rave about it all day so I’ll leave it at that. I’m averaging one book a month which is really not great. I would like to read so many more books. I think I need to start scheduling in reading time and then not skipping that time unless I am physically incapable of reading. Probably sounds a bit ridiculous but in recent months I’ve discovered that activity scheduling really works for me as a concept, and that waiting to feel inspired/motivated to do something does not work. Similar to working out, I know that I feel better when I read books, but yet it just falls by the wayside. Anyway. The book I read in August was The Beach by Alex Garland. It was quite different to the film, although admittedly I haven’t watched the film in a while. I really enjoyed it though. The ending was a lot more grisly than the film, so beware if you’re planning to read it! I stuck to my routine pretty well despite having a busy month in terms of socialising, and I have no intention of beating myself up about skipping the gym or going out to eat pizza instead. I’ve been thinking and I have so much respect for everyone achieving any kind of balance when it comes to fitness, nutrition and wellbeing (and all that jazz). Everywhere you look you’re bombarded with extreme and conflicting messages. You need to hit your protein goals. You need to eat low-carb. 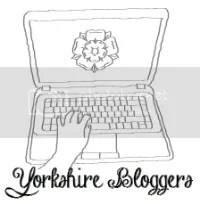 You need to join Slimming World. You need to count calories. You need to punish yourself in the gym. But then, you also need to eat a Domino’s pizza. And a cake. And relax and have some me-time. It’s so hard to eat well and keep active and it’s also so hard to sit on the couch and eat a doughnut without feeling guilty about it. So congrats to all who are finding some healthy balance in the middle of all that, whatever that looks like for you!